Here's how this came about. Yesterday driving home from school I call my husband. Me - "I need to stop at the grocery so is there anything in particular you want for dinner?" Husband - "Really? But you said you'd never make pizza at home?" Me - "Well....are you gonna come home and build me a brick oven in the backyard?" Me - "Okay, I'll give it a go...let's see what happens"
There was some scuffling on the other end so I think he may have been doing a happy dance, but I'm not sure. Get home, make the dough. It seems to be doing what it's supposed to be doing. Need to wait for it to rise so I go finish chores and homework and busy stuff. Finally it's time to make the mix according to what I know my husband likes on his pizza - this part went pretty quickly. Then fill and bake and serve and WOW. I made it this morning before taking Ada to school. It needs to rise at least 2 hours. Then fold 5 or 6 times. Then sit for another half hour or so. put all the dry ingredients for the dough into a large bowl. then add the olive oil and water. mix with a fork until the ball starts forming. flour a work surface then dump the contents of the bowl into the middle of all that flour. work the dough just until you get most all the little loose bits incorporated. spray the same bowl with olive oil and rub a little around the dough ball. 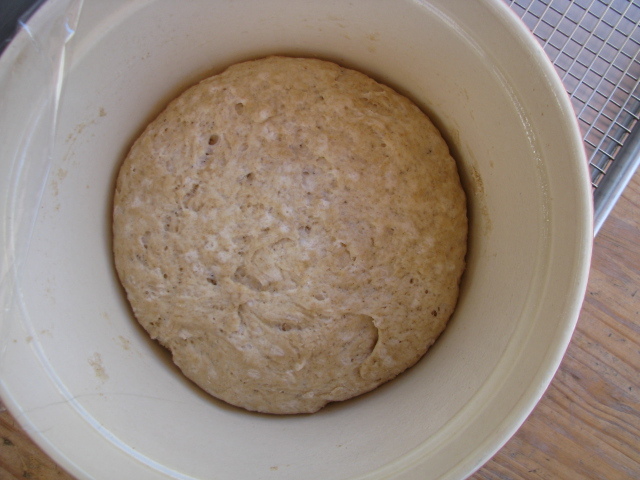 dough ball back into the bowl. leave it alone for a couple hours. 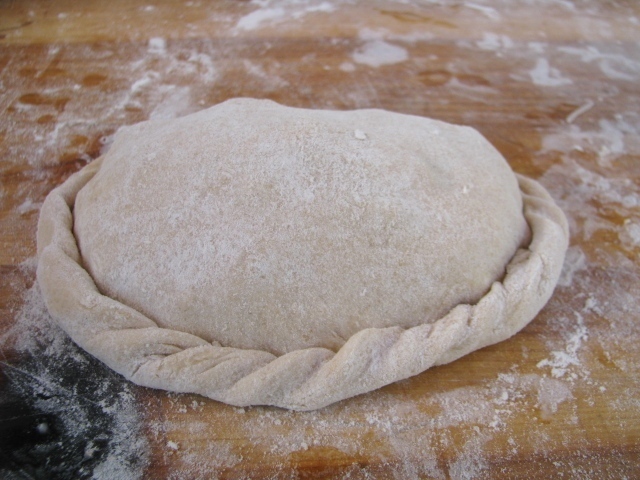 after a couple hours dump that dough ball back onto a floured surface and fold it into itself several times. back into the bowl while you go make the filling and sauce. 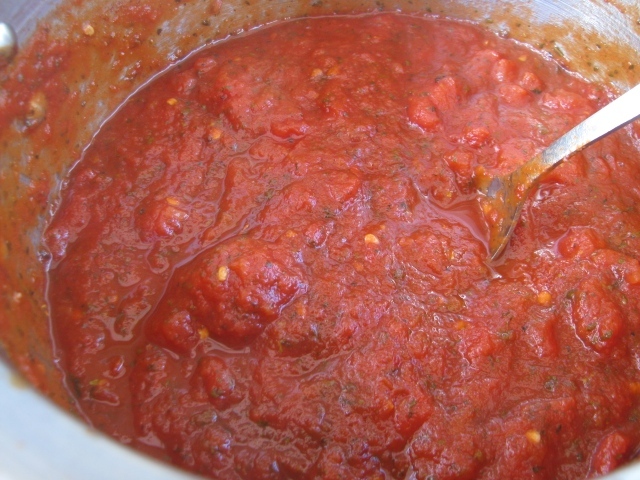 basically put all the sauce ingredients into a pot and cook on medium high heat for a few minutes. taste for seasoning - add a little salt and pepper. then let it simmer while you are making the filling. 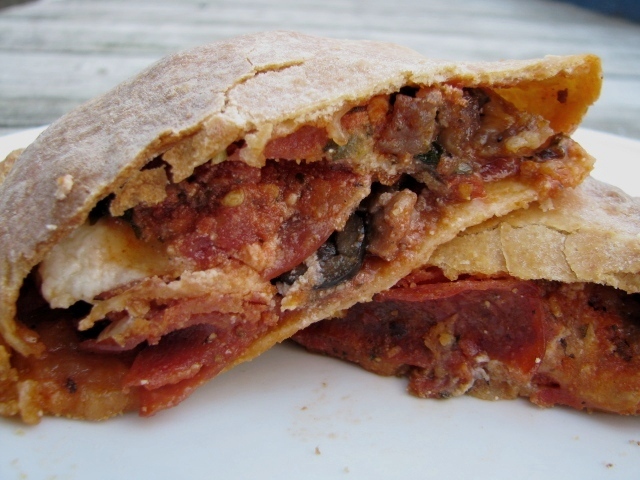 when you are almost done making the filling turn the heat off under the sauce. let it cool for 5 minutes then add a 1/2 cup of ricotta. heat a skillet on medium heat and brown the sausage. when it is no longer pink, remove to a plate covered with a paper towel. 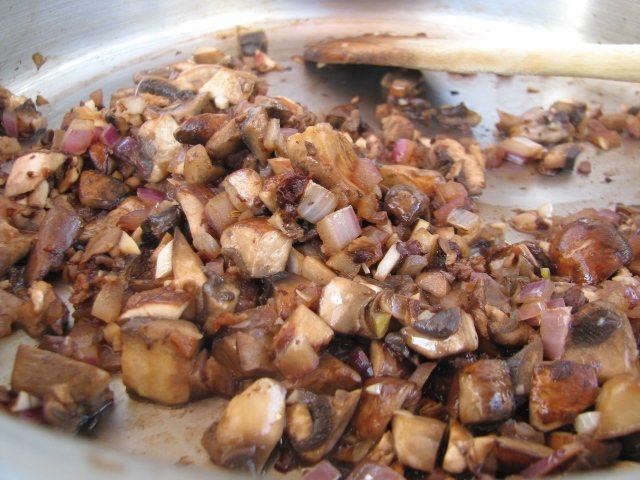 in the same pan saute the onions until soft. 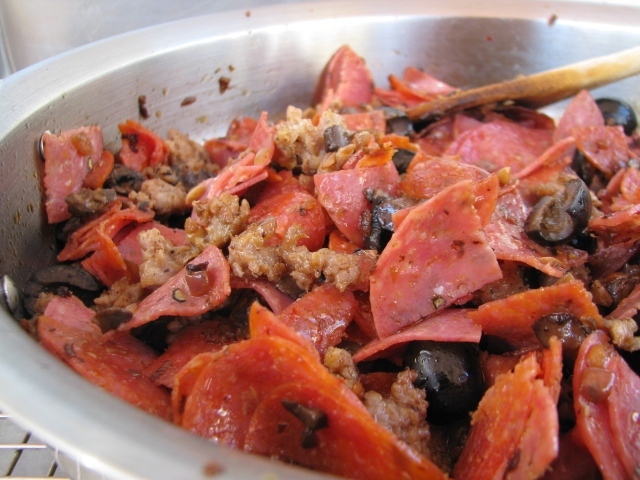 add the chopped pepperoni and salami. cook 7 or 8 minutes. add the sausage back in. turn to low and keep warm. first grab a couple baking sheets and sprinkle corn meal all over the bottom. 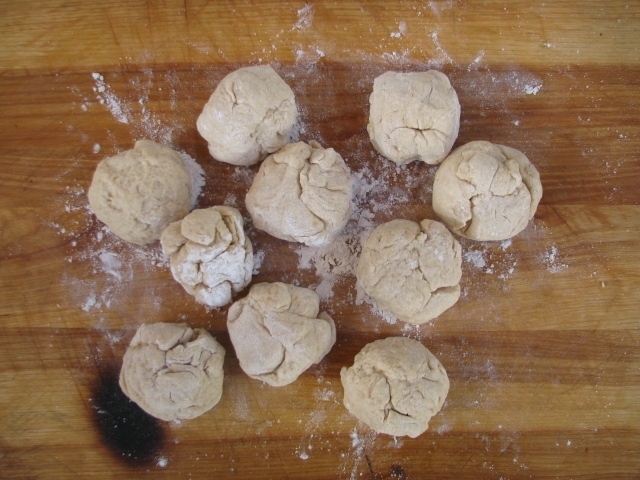 the dough needs to be pulled apart into 10 equal size pieces. working with 1 ball at a time - roll it out until it's about an 8 inch circle. 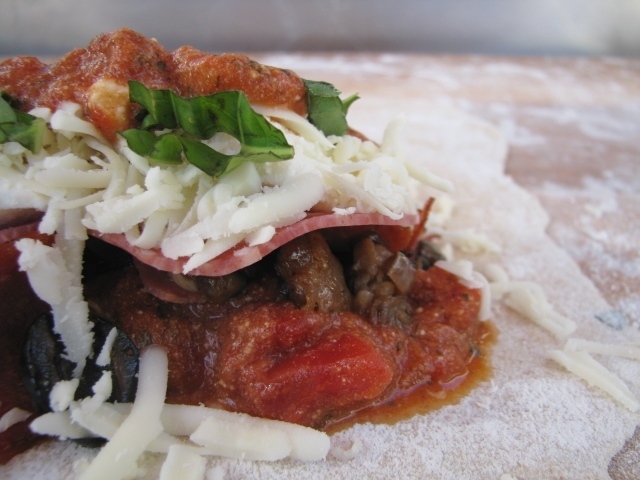 start stacking ingredients on the bottom half of the dough. what i learned between last night and this morning? on the bottom should be the meat mixture. then cheese, ricotta and basil. then top it off with 3 or 4 spoonfuls of sauce. 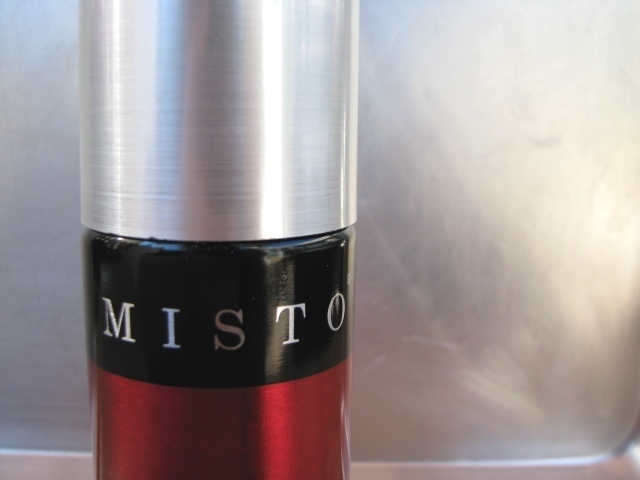 this really helped keep the bottom of the calzone from getting too soggy. i also added a couple extra slices of salami to each pie. 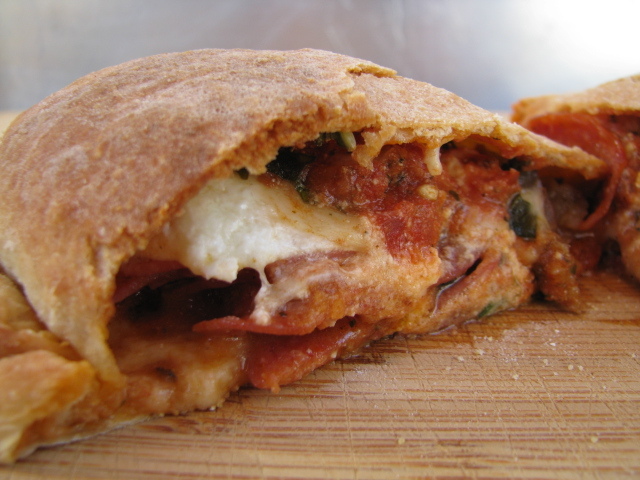 then added a couple dollops of ricotta before adding the mozzarella and basil and sauce. 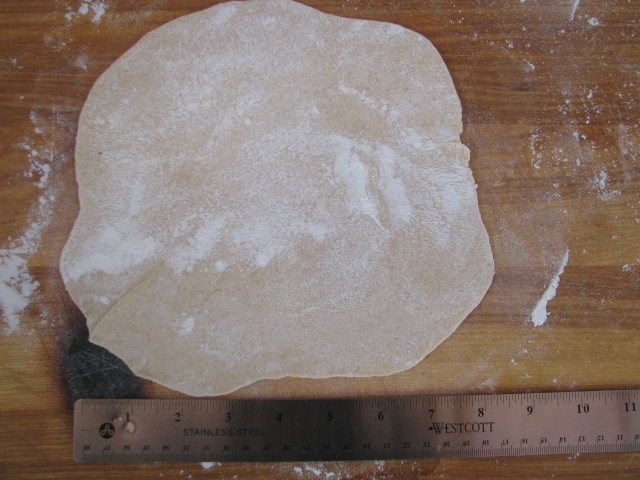 use water to edge the entire bottom half of the dough. 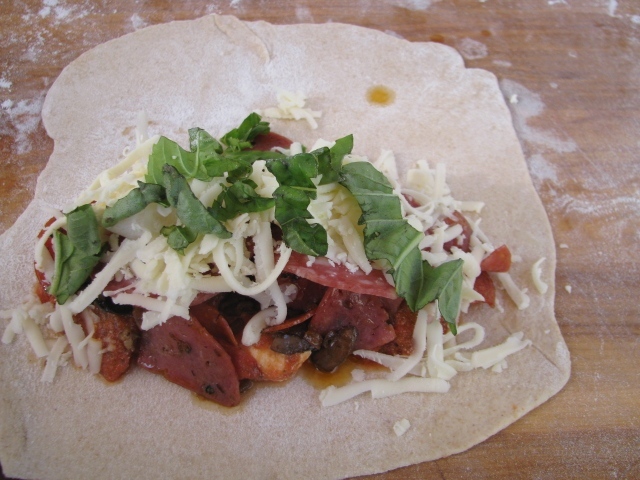 fold the dough over to cover the mix. 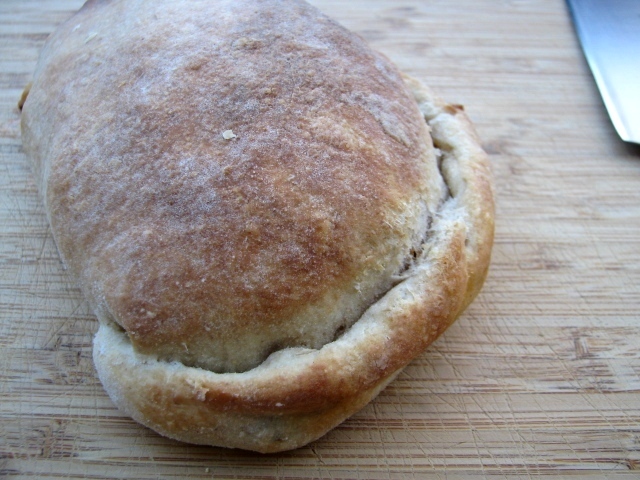 start crimping and rolling all around the edge until the calzone is sealed. carefully move this to your prepared baking sheet. 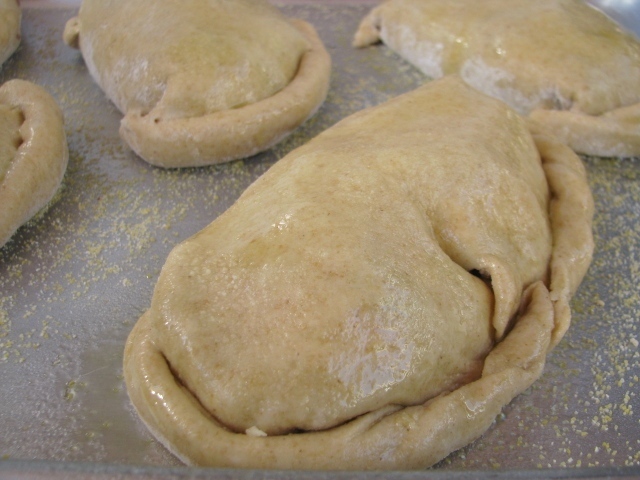 brush or spray all the calzones with olive oil. thank you John and Tina - not sure what i've been doing for olive oil before this. sprinkle some sea salt all over the tops. until tops are dark golden brown.